Here’s another banana-based snack the whole family would surely love. I have yet to try this recipe. 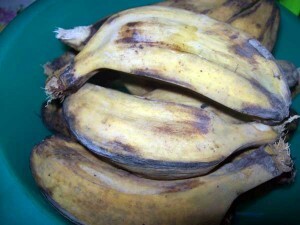 3 1/2 cups mashed ripe banana with peelings. You can use Saba or Lacatan for this recipe. Mix and mash banana fruit and peelings. Add sugar. Place mixture in a pan. Cook until thick enough to cut. Stir continuously to prevent scorching. Add margarine. Add all-purpose flour. Transfer to a board and flatten with a rolling pin. Sprinkle with peanuts. Cut into desired size. Original Recipes by Mrs. Ofelia A. Panganiban. This entry was posted in Recipe, Snacks and tagged healthy snacks for kids, lacatan, pastillas, pastillas de saging, saba, snacks, sweets on February 10, 2015 by Yami.